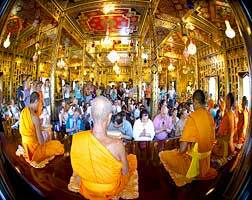 HHT 2019 Inside Thailand, Laos & Cambodia Tour! Overview: Welcome to a great Southeast Asia adventure — a unique tour paced to give you a sense of enjoyment and relaxation in keeping with the culture. Visit Chiang Mai, situated northwest of Bangkok in a lush valley of the Ping River — home to over 300 temples with an alluring blend of interesting architecture, history and beautiful terrain. 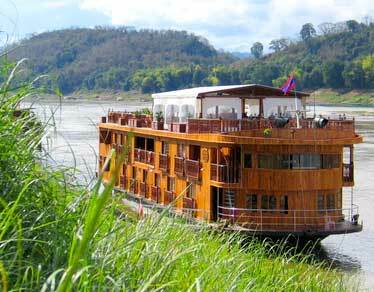 Discover the remote serenity of Lanjia Lodge near Chiang Rai followed by a magical cruise down the Mekong River through Laos to what may be the best city in Southeast Asia, beautiful Luang Prabang. Travel on to the World Heritage site of Angkor Wat in Siem Reap, Cambodia to conclude this remarkable adventure. 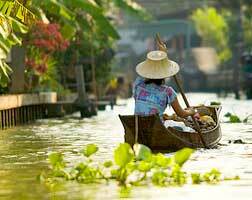 This is a Southeast Asian adventure you won't forget! 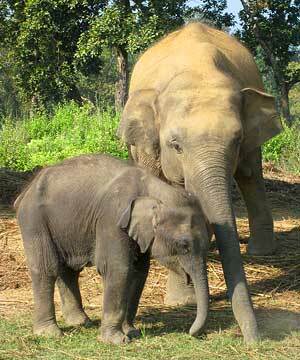 Leadership: The Thailand, Laos & Cambodia Tour Leader is Effie Fletcher, founder and director of Himalayan High Treks. She is a graduate of the National Outdoor Leadership School's course for Outdoor Educators and Goddard College in Vermont. She maintains her certification as a Wilderness First Responder. In the last 25 years, Effie led Sierra Club backpacking trips and overseas trips to Nepal, India, Pakistan, Burma, Bhutan, Tibet and Vietnam. A practicing Buddhist, Effie is the coordinator of the Dharma Journeys Pilgrimages. Note that with an undersubscribed group of four or less, our experienced local staff will lead this trip. 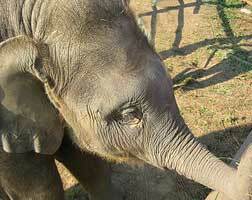 Pre Trip Days: Fly from your home country to meet in Chiang Mai, Thailand. Those in the Americas lose one day crossing the international date line to Asia. Please review your air itinerary with us early to coordinate your arrival time. 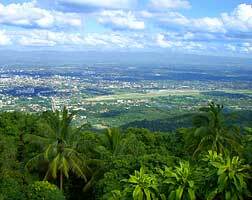 You must arrive in Chiang Mai no later than day 1. If you wish to arrive early, depart late or enjoy additional excursions to nearby regions, we can arrange any needed transfers, accommodations and services with an early request. Day 2: Explore Chiang Mai. After breakfast, our guide arrives at the hotel for today's activities. 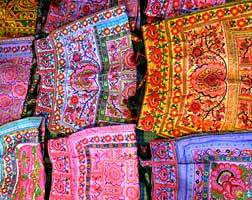 Stroll to the Mae Ping riverbank and on to Waroros Market to meander its colorful stalls. Then, climb onboard your rickshaw for a ride down Tapae Street — Chiang Mai's main thoroughfare. 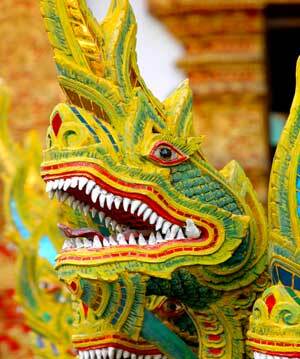 Explore ancient Chiang Mai, starting from its eastern gate. First, see the Monument of Three Kings (which established Chiang Mai as the capital of the Lanna Thai Kingdom) and on to see the city's important temples: Wat Chedi Luang (where the famous Emerald Buddha was once enshrined) and Wat Phra Singh (home to an ancient and sacred Buddha image). Day 3: Chiang Mai Sightseeing. Your car arrives after breakfast for a 15 minute drive to our morning's activity (9 AM until 2 PM). We will enjoy a unique cooking experience in a traditional teak–style house surrounded with pretty gardens. This family–run school presents a wide variety of classic and specialized northern Thai dishes. Begin with a visit to a local market to shop and learn about the fresh foods and spices that you will use in your cooking class. 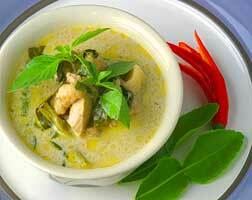 Under the watchful eye of the experienced chef, you will learn how to cook inspiring and delicious Thai dishes. But the best part of the day is sitting down for lunch — to eat what you have cooked! 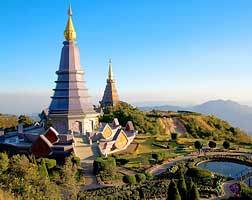 To experience the best sites of Chiang Mai, timing and location help reveal its hidden treasures. After such a relaxing morning, meet our guide at 3 PM to begin our city and temple tour. 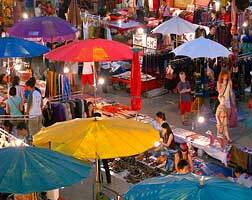 Explore more of ancient Chiang Mai — with its old city walls, gates, moat and markets. After visiting Wat Suan Dok (where ashes of Chiang Mai's royal family are interred) and the historic Jed Yot Temple, continue up to Wat Prathat Doi Suthep Temple, the most sacred in all of North Thailand. Our experienced guide will speak about the temple and the famed white elephant as we stroll through its impressive chedi and beautiful murals. Day 5: At the lodge. After breakfast, a presentation begins at 9:40 AM discussing the Hmong and Lahu hill tribes, the Golden Triangle and the giant catfish (Pla Buek, the world's biggest fresh water fish) found in the Mekong River. Learn about the activities and people whose lives always depend on the river. Day 6: To Chaing Khong, Huay Xai and Pakbeng. 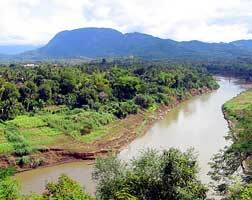 Our guide will arrive at the lodge to bring us, by air–conditioned vehicle, to the border at Chiang Khong/Huay Xai. At this point your Thai guide will bid adieu. Day 7: Pakbeng, Pak, Ou, Luang Prabang. 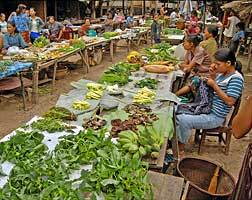 Planning for a quick, early breakfast, make time to enjoy an (optional) visit to Pak Beng Market — a very popular place with villagers and hill tribes to buy and exchange goods. By 8:30 AM sharp, our boat departs. After a brief stop at Ban Baw to appreciate the making of traditional rice liquor, our buffet lunch is served onboard. 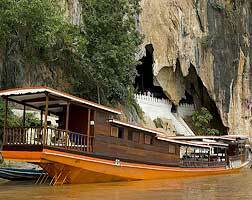 This afternoon we visit Pak Ou Caves, two hours upstream from Luang Prabang. Pak Ou (or Tam Ting) Caves contain a huge array of gold–lacquered Buddhas in two chambers, carved out from a towering limestone cliff. Statues range from only a few centimeters up to the size of a human. The caves are a popular pilgrimage destination. Day 8: Luang Prabang. 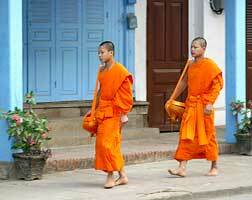 At dawn today, there is a special opportunity for you to witness Luang Prabang's monks collecting their alms. As the sun begins to rise, long lines of orange–robed monks withdraw from their pagodas to walk the streets barefoot while collecting offerings. 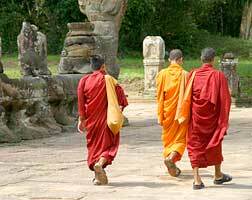 It is a beautiful, serene ceremony that highlights the spiritualism of Laos. 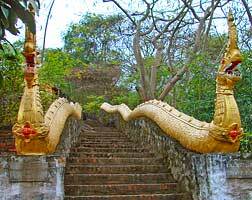 A short ride brings us to historical, central Luang Prabang. A good spot to begin is at the local Fresh Market. We can meander the stalls to examine goods and regard the locals, as they shop each day for vegetables, fruits and exotic specialties. Return to the hotel for breakfast. After breakfast begin a city tour at the former Royal Palace (now the National Museum). The palace was built in 1904 (in the French colonial era) for King Sisavang Vong but is now home to exhibits of art and jewels. Visit Wat Mai with its unique five–tiered roof and golden bas reliefs. During Pimai (the Lao New Year) the small Buddha statue (Pra Bang, housed in the palace) is put on display in this temple. 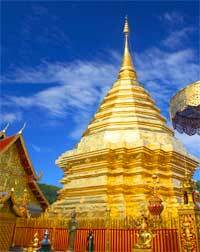 Visit Wat Sene and its beautiful golden facade. Complete your morning journey at the most photographed temple in Luang Prabang, Wat Xieng Thong. After lunch, we'll weave our way to the weaving village of Ban Phanom. Populated by Thai Lue (a tribe with origins in southern China), this village, is renown for its cotton and silk hand weaving. Also visit Henri Mahoit's grave before return to Luang Prabang. Day 9: Kuangsi Waterfall. After breakfast, visit colorful Wat Visoun Temple, the famous Watermelon Stupa, shaped just like the fruit! This temple was destroyed in 1887 by invading Black Flag troops from China, but was restored in 1930 by Buddhist monks and locals. 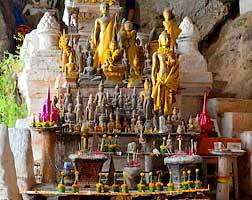 Visit Wat Aham village and the brilliance of its "altar of the two geniuses of Luang Prabang." 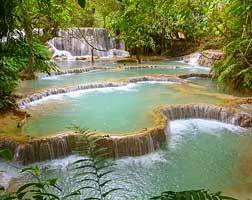 Revitalize at the refreshing Kuangsi Waterfalls, located 20 miles from Luang Prabang. 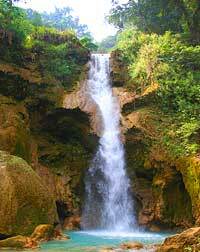 The falls cascade down a tiered limestone formation to form several turquoise pools, perfect for a hot day swim. The jungle and the undergrowth surrounding the falls team with wildlife. Pleasant walks are found along its natural footpaths. Indulge with a picnic lunch at cooling Kuangsi Waterfall. Day 10: Elephant Village. After breakfast, we meet in the lobby between 8:30 and 9:00 AM. 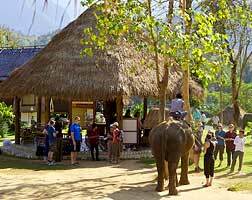 This morning's excursion carries us to a half-day riding program at Elephant Village. Day 12: Luang Prabang to Siem Reap. After breakfast, it's time to check–out of the hotel. Our guide and private vehicle will arrive for a farewell and airport transfer for our flight to Siem Reap, Cambodia. On arrival, outside the secured area, we will be welcomed by our next local guide. 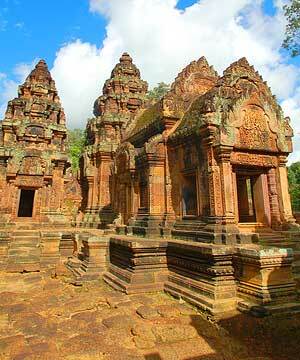 Siem Reap is best known as the hub to explore the fabled Angkor temples, in the ancient capital of the Khmer Empire. Day 13: Exploring Siem Reap. This morning, see the radiant gem of Angkor — the temple of Banteay Srey (best seen in the morning light). 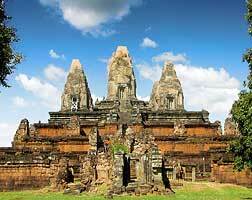 Built during the 11th to 13th centuries, the "Citadel of the Women" still remains the best preserved Cambodian temple. 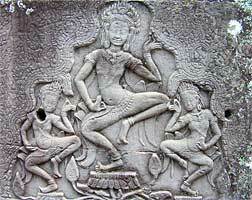 It displays fine examples of classical Khmer art and is noted for some remarkably fine bas–reliefs, depicting the Hindu god, Shiva. Banteay Srey is uniquely constructed from pink sandstone, which is seen nowhere else in Angkor. Returning to Siem Reap, stop at the profound Land Mine Museum, promoting land mine awareness and education. Mr. Aki Ra, the museum founder, was a child soldier during the Khmer Rouge regime and today acts as a humanitarian de–miner. The museum also serves as a rescue center for amputee children Aki Ra has brought from the streets of Phnom Penh and nearby impoverished rural communities. It is possible to stop at some villages along the way and our guide can help connect with villagers to learn their way of life — observe rice paper being made, taste palm wine and palm sugar, all popular local products. 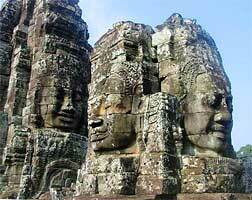 This afternoon we will visit the ancient site of Angkor Thom. 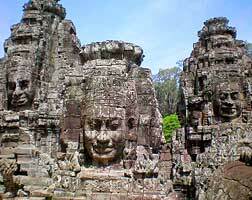 Angkor Thom was the last capital of the great Khmer Empire, under the reign of Jayavarman VII. This city is bound by a wall, eight meter high and four kilometers long, drawing a perfect square. Enter through the ancient South Gate, an impressive stone portal carved with elephants and four giant faces. 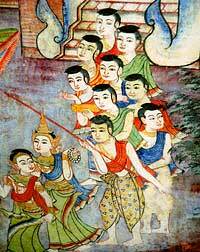 To each side of the gate's path, a row of 54 gods or demons hold the sacred Naga snake. Day 14: Exploring Siem Reap. This morning, visit some early Angkor–era temples of the Roluos Group, found 15 kilometers outside of Siem Reap. 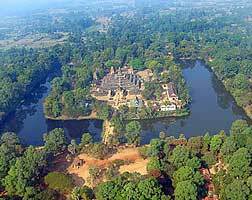 Roluos is the ancient center of Khmer civilization, which was known as Hariharalaya. 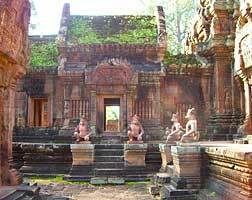 It was the first town built by Angkorian kings in the 8th and 9th centuries and consists of three main temples: Bakong, Loleiand and Preah Ko. The surrounding paddy fields and sugar palm trees are typical scenes of Cambodia. You'll especially appreciate the gentle scenery as we ride on an Oxcart — a fun way to experience rural Cambodia and regard its friendly people. Arriving at a small contemporary pagoda, Buddhist monks will conduct a private blessing ceremony for us, wishing good health, a safe journey and a very special experience! In the afternoon, explore the temples of the Small Circuit. 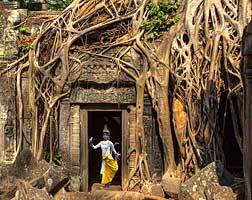 The most illustrious is Ta Prohm, built in the mid 12th to early 13th centuries. Day 15: Departing Siem Reap. After breakfast, our guide brings us to the airport to depart Siem Reap, Cambodia and marking the conclusion of this Southeast Asian oddyssey! Important Notes: This description is meant only as a guide to our planned itinerary. Changes may be made as we go along depending upon local conditions, our acclimatization and for health and safety. Good health, an inquisitive mind and a positive attitude make travel enjoyable. Air-conditioned road vehicles are provided throughout. Many of the areas to be visited are remote and there are less reliable sources of medical care when outside of main cities. Travel Details: If you arrange your own air travel, remember to arrive in Chiang Mai, Thailand no later than day 1 and not depart from Siem Reap, Cambodia until day 15. Advise us of your itinerary before you purchase tickets to ensure you arrive and depart on schedule! You are welcome to arrive early or depart late. If you have time, we can arrange additional accommodations and area tours anywhere in the region (Bali, Thailand, Burma, Laos, Cambodia, Vietnam, India, Nepal, Bhutan...) along with guides and transportation. Advise us early and ask about all the options we can suggest for your trip. If you have any flight stopover needs, we can help assist you with arrangements. Please refer to the booking information section of our application form for more information. Ask us early for any details and we are happy to assist with the best options for your trip planning. Passport, Visa(s), Physicians Visit, Emergency Medical & Evacuation Insurance, Travel to Chiang Mai, Thailand or from Siem Reap, Cambodia, Meals Beyond Above Itinerary, Beverages, Spending/Personal Money. 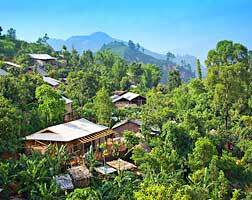 Mild: Accommodations are in comfortable guest houses and four–star hotels. Activities are mild and can include day hikes of less than four hours in length. Vehicle time can include fatigue with long travel along rough roads.